Southern Oregon is the perfect place to live and raise a family. The climate is wonderful, good schools, and many outdoor recreational activities. Southern Oregon is a haven for the outdoor enthusiast. Some of the boating and water sports include rafting, swimming, kayaking and canoeing in the many rivers and lakes. There are plenty of creeks as well. With snow-capped mountain peaks in the winter, mild springs, warm summers, and mild falls, Southern Oregon has a diverse climate with four distinctive seasons. 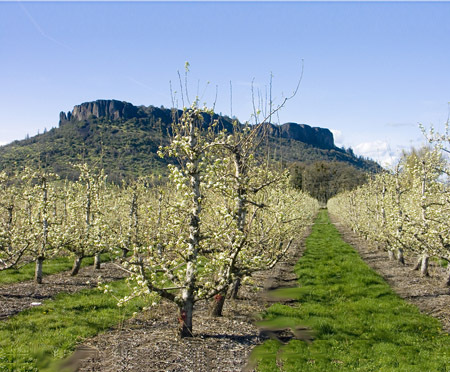 The Rogue Valley is known as "pear country," many pears are grown here. The climate is also conducive to growing grapes, and there are many local vineyards and wineries. Rogue Valley is an excellent place to garden. Southern Oregon is home to the Oregon Shakespeare Festival, known worldwide for it's productions, the Britt Festival for outdoor performances, the Rogue Theatre, Museums, Art Galleries, Fine Restaurants Gift Stores, and an abundance of Antique Stores. There are are many cities and towns in our area, some of the larger cities include Ashland, Medford, Grants Pass and Roseburg. Each town and city in our area is very unique. Ashland is more cultural, with theatres and plays, Historic Jacksonville is rich in history, Medford is known for shopping, and Grants Pass is home to the Boatnik, Fabulous Fifties car show, and many Antique shops. 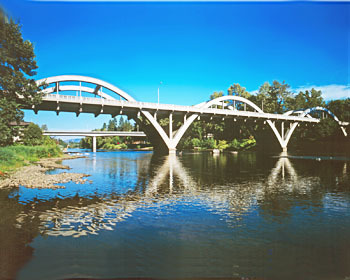 Nearby smaller towns are usually very historical, some with covered bridges, old gold mines and waterfalls. City profiles are listed on the next page, use Menu above or click below.